Even today it’s hard for me to listen to this song without tears coming to my eyes. It’s such a perfect example of the synergy between Chyi Yu, Li Tai-Hsiang, and poet Hsiang Yang. As with much great art, there’s a combining of opposites: joy and sadness, innocence and experience. The style might be called light classical, the main instruments being harp, oboe, and strings, but with the addition of electric bass. As many times as one listens to this song, it’s always perfect, with not one note or inflection out of place. From 1987 on into the 90s, Chyi Yu recorded mostly English songs. She reminds me a little of Greek-French chanteuse Nana Mouskouri for a few reasons: Both were influenced early on by Joan Baez; both have big hearts and like to make people happy, so they sometimes surrender to the popular taste and sing English songs which everybody knows and requests, but which aren’t the best poetry (tending toward the sentimental); and because of their kind and empathetic nature, both have been selected as ambassadors of good will. In both France and Taiwan, a singer is… well, a singer — an entertainer. Both Nana Mouskouri and Chyi Yu have struggled to be taken seriously as artists while also cooperating with the need for people to have their pop idols imbued with a certain cosmetic glamour. In Nana’s case, her trademark thick-rimmed glasses say “I’m an intellectual — not some bar room singer!” Chyi Yu has a degree in cultural anthropology from prestigious NTU (or was it UCLA?)) and is nobody’s fool! Chinese pop-ballad sensation Chyi Yu is all set to take the stage for her final solo concerts, five years after she last appeared in Beijing. Often dubbed “China’s Enya,” the 51-year-old singer met with the media dressed in her signature Bohemian style. While most expected to learn the details of her upcoming concerts, Chyi shocked reporters with the announcement that her November performances would be her last solo concerts ever. Then she burst into tears. “The reason is simple: singers hold solo concerts because they have the ambition to propel their career to a higher level. I’m living a peaceful life now, devoting my time to Buddhism. I think this concert will draw a perfect conclusion to my career,” Chyi explained. Billed as The Voice – No Boundaries, her concert will focus solely on her music, without dancing or visual effects. Artistic director Jin Zhaojun said that many concerts these days tend to be over-enhanced by technology, with the music itself marginalized. The music diva will present 20 timeless classics in both English and Chinese, including Amazing Grace and Vincent, the Broadway hit Memory, as well as her smash hit The Olive Tree and Swan Lake, a reprise of her collaboration with [the] Russian National Orchestra. By her own admission, she has never been a prolific performer. The past three decades of her career only saw seven Chinese albums and seven English releases, with a number of chart-topping singles… “God gave me a good voice, but I’m not active enough. I am not a planner and I sing as I like. Singing has always been my hobby, not a means of living,” Chyi explained. She added that the decline of China’s pop music industry, the prevalence of piracy and the change in listening trends also impacted her music. In 2002, Chyi converted to Buddhism. She then released four albums featuring Buddhist chants. Like former New York Yankees sportscaster Phil Rizzuto, Chyi Yu has come out of retirement a couple of times, but her concerts remain rare. She recently said that the changing moods and emotions of pop music tease the senses, while soulful music precipitates quiet and encourages self-cultivation — purposes well-suited to her later years. Not every Buddhist recording she releases is of equal quality. Some are more distinctive, while others sound more “generic.” I look at it in terms of genotype and phenotype. Much Chinese Buddhist music that’s meant to please the general public shares a common genotype or familiar sound created through traditional elements, but particular examples of the genre manage to break out of the genotype and show their own distinctive traits, their phenotype. The artist brings something of his or her own personality and life experiences to the music. This is what I look for. An amusing side note is that Chyi is often described as a “Bohemian” — a term which may strike the Western ear as slightly archaic for someone who discovered the sixties in the late seventies. 😉 Perhaps the most famous Chinese Bohemian of the last half-century was writer San Mao, who went backpacking, married a Spaniard, wrote romantic novels and poems, and tragically committed suicide in 1991. 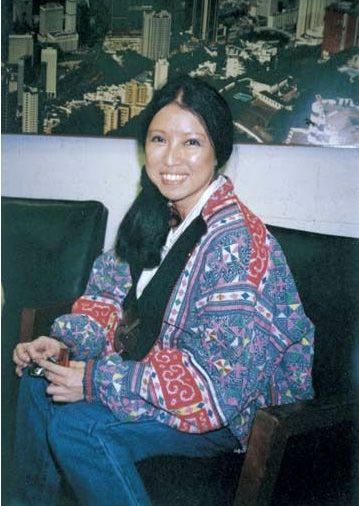 In 1985, she collaborated with Chyi Yu and Pan Yue Yun on the album Echo. In a roughly-translated interview with the Yangcheng Evening News, Chyi talked about the purity of the burgeoning campus folk scene in the late 70s, and of reading San Mao’s work in high school. She told San Mao it may have been God arranging their fate when they later came to work together. As she and Michelle Pan were recording “Dream Field,” San Mao began sobbing because it reminded her of her husband José (who had drowned six years earlier). Thanks to windcglider’s blog, we know the lyrics to this song say that In each person’s heart there is a field where the seeds of dreams are sown. What should I plant? What should I plant? Plant peaches, plums, and spring’s breezes… If the lyrics are upbeat and idealistic, the melody and video speak poignantly of the distance between everyday life and that special place inside our hearts. San Mao (1943-1991). May she find release from suffering. Chyi Yu’s music is available from iTunes, Rock Records (Asia), and other distributors. You may also find imports for sale at Chinese music outlets in Western countries.